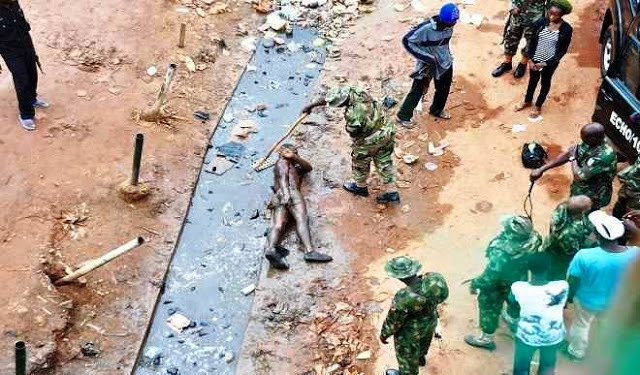 Check out what some army officials did to a civilian in Nasarawa state this past weekend. 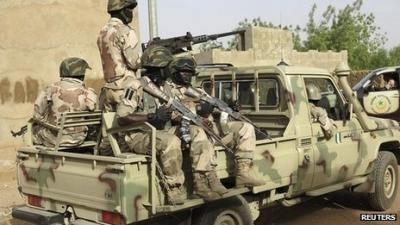 According to eyewitnesses, some soldiers descended on a civilian who violated sanitation rule in Mararaba on Saturday and beat him to coma. They were paid to secure lives but instead these monsters in uniform have turned civilians into animals. The can’t brutalise criminals but they can torture uarmed civilians. It is high time the government do something about this. Oh! My God, this is inhuman ! Just bicus they were on army uniform. Its unfair! Government should called them to order please!!! U cant see this in advance nation. Whenever they are on their uniform they feel that they are on top of the would, most especially the army and police. most of them are not physically strong, just using their uniform to intimidate innocent civilians. These animals will just desert the army if their names appear among those that will go to sambisa forest to face Boko Haram group. Enough of this harassment please. Oh! My God, this is inhuman ! Just bicus they were on army uniform. Its unfair! Government should called them to order please!!! U cant see this in advance nation. Whenever they are on their uniform they feel that they are on top of the world, most especially the army and police. most of them are not physically strong, just using their uniform to intimidate innocent civilians. These animals will just desert the army if their names appear among those that will go to sambisa forest to face Boko Haram group. Enough of this harassment please. go and torture shekawu not unharmed innocent civilian.